The Asus Zenfone Selfie isn't too quiet about what it tries to be - a smartphone for taking photos of yourself. With 13 megapixels front and back it sure has nailed the numbers game and the dual-tone dual-LED flash makes it a one-of-a-kind offering. OK, second of its kind, but still a rare breed. Judging from the information, which we’ve gathered so far, we can say that we’re impressed by the performance of both 13MP cameras and the quality of the sample shots. Their menus are full of settings and shooting modes, so you can spend a lot of time playing with them. As we expected, ZenUI offered a lot of features, modes and pre-installed applications, which might not be considered as a plus by some users. We also liked the performance of the SoC – not as much in the computing and graphic tests, but rather in the temperatures test. It would’ve been nice if the device had more durable battery, since the result in our web browsing test wasn’t that high, but on the other hand, on the video playback test the device scored 12 hours – a rather impressive score. The Asus Zenfone Selfie takes good selfies indeed. However, with the powerful front camera, we expected even better. There is still a slight hint of pixelation in slightly dimmed fluorescent light conditions, although it does do a much better job than most other phones out there. Performance is smooth, and except for its large dimensions and the small volume keys placed at the back, there is no real ‘bad’ thing about it. At Rs. 15,999, it falls in near range of the Xiaomi Mi 4, the ZTE Nubia Z9 Mini and the Coolpad Dazen, all of which have a better form factor, along with similar performance and good camera performance. You may go for it, if you want a Zenfone with brilliant cameras on both ends. If ergonomics take the front seat, the others reasonably make more sense than the Asus Zenfone Selfie. The Zenfone Selfie is unlikely to sway those considering the latest and greatest Android handsets but for those just looking for a mid-range handset that does the basics well and that can also boast an easy way to take great selfies it absolutely fits the bill. Model: With selfies being recognized as a trend that is here to stay for a while, Asus has also recognized the importance of easily capturing self-portraits on a mobile device. 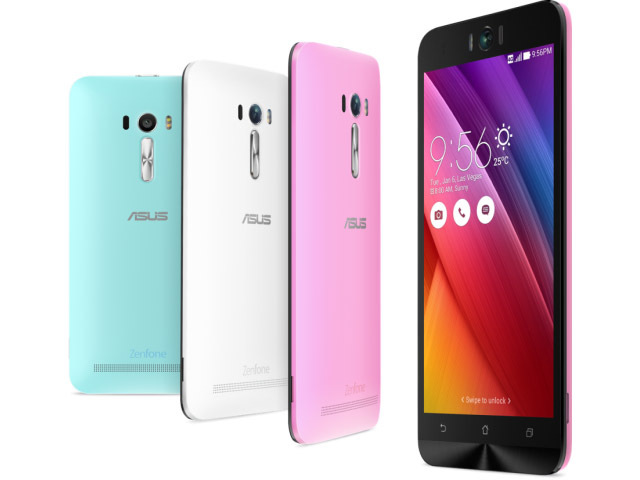 The Asus ZenFone Selfie ZD551KL is a smartphone designed with two high-quality cameras. Asus has placed emphasis on ergonomics with an arc design to enable easy gripping and the installation of a rear button certainly helps with operating the front-facing camera. There are 3 colours to choose from; pure white, chic pink or aqua blue. The Android 5.0 Lollipop device comes with a 5 inch Full HD display panel with Corning Glass protecting the beautiful screen. On-board is an octa core processor in the form of 2 Cortex-A53 quad-core processors, either 2 GB or 3 GB RAM, and 16 GB or 32 GB of internal storage. The main drawing point of the Asus ZenFone Selfie ZD551KL is the front and rear cameras, featuring a 13 MP auto focus PixelMaster sensor each. Other features on the device are Bluetooth 4.0, microSD support, dual-SIM support and A-GPS. The 170 g Asus ZenFone Selfie ZD551KL comes with a 3000 mAh Li-Polymer battery, which should satisfy the most hard-core selfie-centric user.